"The author deftly balances the underlying, simmering dangers of violence, sexuality and deep animosities that have withstood the test of time. And while the solution to the old murder begins to surface, the danger of a bloody history repeating itself heats up. This is a veritable page-turner that will keep readers at the edge of their seats until the unexpected, yet satisfying ending. Highly recommended!" The Columbia Review. 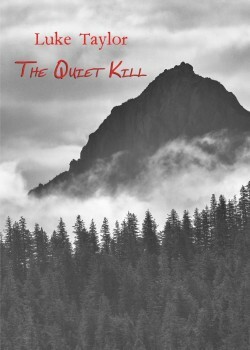 “The Quiet Kill” by Luke Taylor is a murder mystery with a strong romantic theme. The main character is a self-loathing, yet commercially buzzing writer, a “hack,” who is introduced as follows: “Loeb Cohen cannot write. He can barely spell and sometimes resorts to making up his own words. He can only spit out page-turning pabulum like a franchised fast food chain.” Alas, as the reader soon finds out, Loeb’s creator, the author, can write, spell, and deliver a spellbinding mystery of high quality and great suspense. The story takes Loeb and his funky paramour, Cat, (“Catriona”) from Los Angeles to Alaska, to her childhood place at Quill Creek. He thinks it’s a writing vacation of sorts, a muse for a new book, but Cat has other, more ominous reasons. “She was back. I guess there’s no leaving Quill Creek, she thought. Not now, not ever. It was my idea, he fell for it, now we’re here, together.” Her parents, a Russian Jewish immigrant and a local girl, had died in a plane crash. Her Russian aunt, Sarah Enos, who became her guardian, was murdered soon after. Many years later, Cat brings Loeb here for a reason: “But now, by God, you’re gonna use everything you’ve got up in that computer brain of yours and we’re gonna find who killed Sarah and why.” And with this, a clever murder mystery is off to a roaring start. “The Quiet Kill” brings together a perfect storm of emotional and cultural conflicts, old, dark secrets, and a quirky, authentic Alaskan setting. The pace is fast enough to keep readers in suspense, yet the characters are three-dimensional and the facts unfold with clarity and plausibility. The author deftly balances the underlying, simmering dangers of violence, sexuality and deep animosities that have withstood the test of time. And while the solution to the old murder begins to surface, the danger of a bloody history repeating itself heats up. In summary, this is a veritable page-turner that will keep readers at the edge of their seats until the unexpected, yet satisfying ending. Highly recommended!